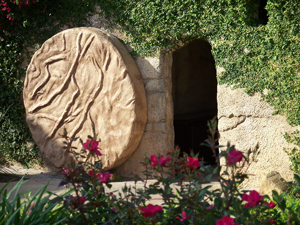 Today we are comforted by our faith in Christ’s resurrection, knowing that we too will come to a day of resurrection. But it was difficult for the people of Jesus’ time to understand this idea. Christ had not yet been crucified and raised from the dead when He spoke the words in today’s Gospel: “Whoever keeps My word will never see death.” The Jews could not understand, so they picked up stones to throw at Him. Today we can take a moment to reflect on what we do not understand. God sees all things. He knows all things and hears all things. We are humbled when we realize that we are neither almighty nor omniscient. We are called to act with compassion toward those we do not understand. We are called to listen and to truly hear the experiences of others instead of offering an immediate reply. This day’s readings are packed with promises from God. These promises are often beyond our understanding.